Don’t lose your luggage, wallet or keys again! If you’re always fumbling, stressed, and wasting time looking for these items, you do need Pixie! It’s the only 2-in-1 key tracker on the market that utilizes audio and visual location methods to provide you with the most options for finding your missing items. Just add a Pixie Point to anything you want to keep track of and eliminate the stress! You can find your lost or misplaced item faster if you see where they are, right? 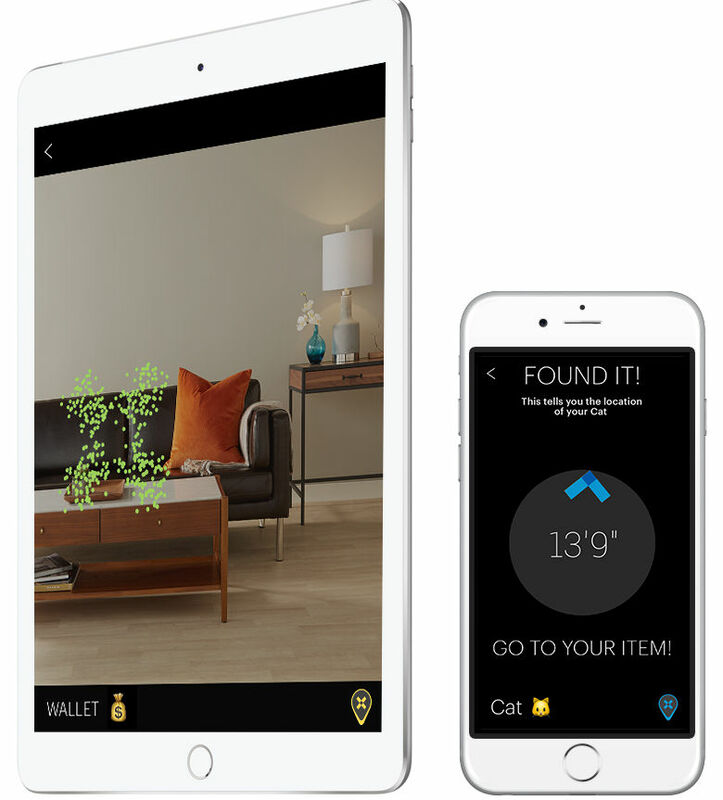 That’s why Pixie uses augmented reality to show you the location of your missing items. The “X” that appears on your Pixie App marks the spot of your lost item. After revealing their location, Pixie provides you with the “Direction” and “Distance” – actual feet and inches – indications that guide you with turn-by-turn directions. The “audio” function works by beeping when you get close enough to your keys or items so you can quickly find them no matter where they are hiding. 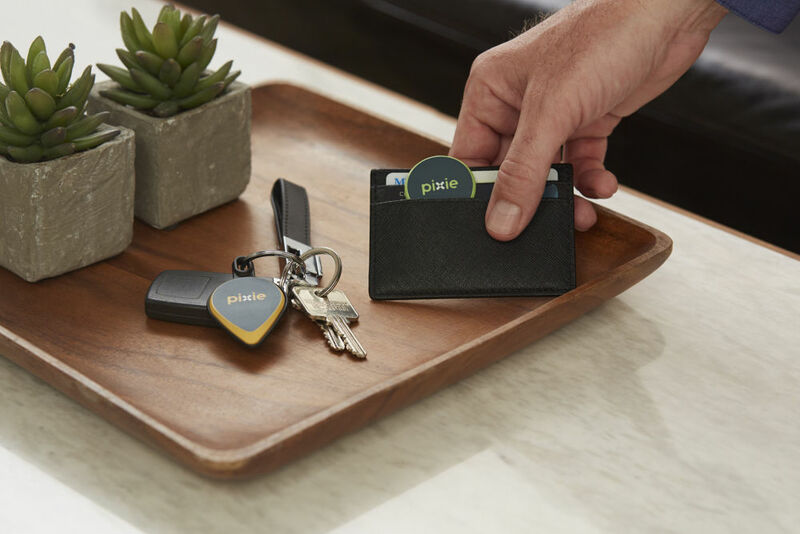 Pixie is unlike traditional Bluetooth finders on the market, only Pixie features augmented reality technology that allows you see your lost items, whereas others only offer beeping to help you find your items, which may be difficult to hear in crowded places. This feature lets you use your iPhone or iPad to know exactly where your item is, simply scan the room as though you are taking a panoramic picture and Pixie precisely points to the location of the object. As an added feature, when you are within arm’s reach of your missing item, the Pixie app will beep to help you find it. Finally, the “Last Seen” feature helps you find your objects even when you have left them behind or they are out of range (more than 100 feet away). A left behind item will show up on a map so you have a starting place to search for it. 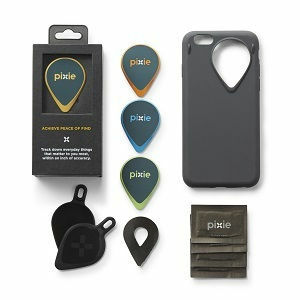 The Pixie Points have the look and shape of a guitar pick and work fast with unprecedented accuracy. Just download the app from the Apple App Store and attach the first Pixie Point to your iPhone. Then, pair the other Pixie Points and attach them to anything you want to keep track of: keys, wallet, luggage etc. This small device less than 1/10th of an inch thick has a one year of battery life – requires no charging and no maintenance. It is also IP67 certified and rated product, meaning it and up to 3 feet deep! Now you don’t have to worry about using your Pixie Points in the rain or other areas exposed to weather. 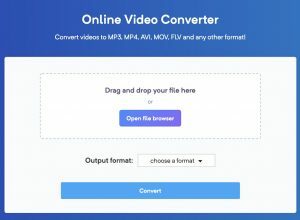 What’s the technology behind Pixie? Pixie is the new Location of Things (LoT) technology™. Three years of research, studies, and product testing were done to ensure its accuracy. The Pixie Team was able to build a groundbreaking platform incorporating the benefit of the Location Awareness to the Internet of Things. Go to the app, which shows you in one list exactly where your items are… literally how many feet and inches they are from you. Need to track one of them down? Simply select that item from your list, hit start, and begin scanning the area. Pixie guides you with its turn-by-turn direction so you can find them faster – no more wandering around the house helpless. One might say that it’s like having an “indoor Waze” that provides you with the exact location of something you’re looking for easily…and directions to get there fast! This product’s platform is innovative and suitable for the multitaskers who don’t have time to figure out how things work. It helps them locate their items accurately and easily. The device works with a powerful, readily available hardware called the Pixie Point and a location engine, which can point to the direction of an item. The location engine also calculates the exact coordinates of the object, meaning you don’t have to figure those out yourself. Even if there is only one or a couple of items around, the location engine will map out its location precisely. 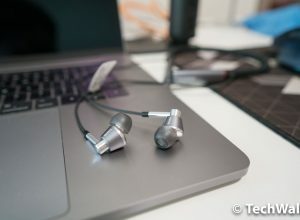 It’s built with a highly advanced and useful power management system, which makes it long lasting and a powerful function that most tags on the market cannot match. Pixie Points talk to each other. They’re like friends keeping track of each other’s whereabouts. This is great for providing accuracy, but also great in case you lose your phone! Since all the other Pixie Points know where it is you can login to your Pixie App account and find your iPhone even if it’s off, out of battery, or on silent! Don’t fumble for your keys again nor spend tireless hours looking for your luggage. Use Pixie to locate where your items are – ACCURATELY. The product makes use of augmented reality, which can show the lost items even without you trying hard to look for the TV’s remote control under the sofa, bed or anywhere. Without you moving an inch, Pixie finds your items without you exerting any effort to do so. Thanks to its Augmented Reality feature plus VISUAL guidance that helps you locate your keys even while being surrounded by noise wherein hearing a beep might seem impossible. Pixie not only uses Bluetooth technology, but it also uses its patented LoT technology™. This combination lets the Points talk to each other to monitor where each other is. In that case, you can make use of accurate distance directions, which allow you to find your lost items quickly. The product has a high search range of between 30 and 50 feet indoors and up to 100 feet outdoors. It’s the only product of its kind on the market that lets you locate your missing items down to the last inch. If it’s out of range, there is no need to sweat. The product displays the last seen location of your items so you can easily retrace your steps. If you forgot to charge your iPhone, you don’t have to worry. 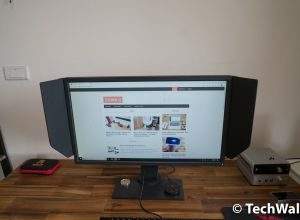 Pixie can find it even when it’s in silent mode, battery dead or turned off. Finally, right? 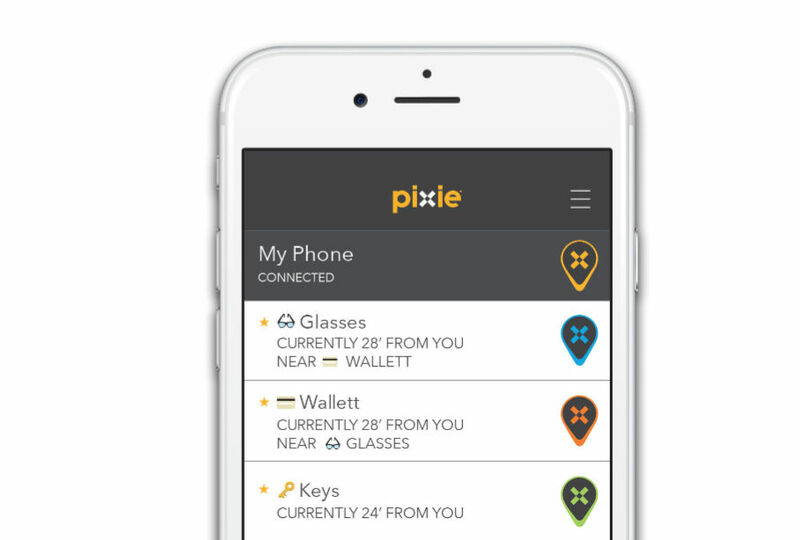 Unlike other finders that can only find your Phone when it’s on and when the App is open, Pixie takes you to your lost phone even when it’s out of juice. Now, that is Peace of Find! Every Pixie account can be used with up to seven items, plus the point on your iPhone/iPad. The package also comes with key tracker chains, pet collar adapters, and adhesives so that you can attach them to anything, including on your dog’s name tag. 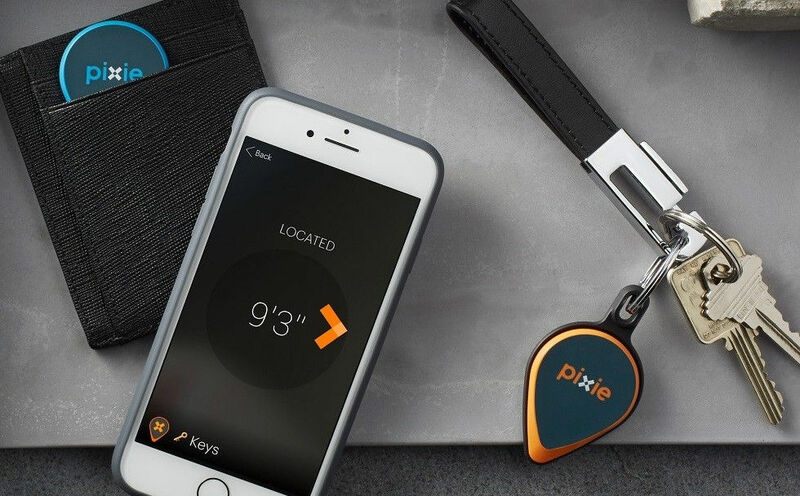 Pixie is the only tracker that comes loaded up with all the accessories you need to track pretty much anything. 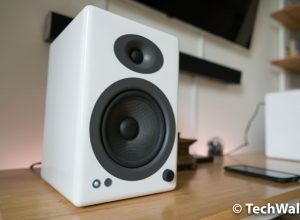 Consumers can also choose between various kit options, on the getpixie.com website you can get the right number of Pixie Points for you. Choose the kit that’s right for you, or if you buy our 8pk Kit, we will ship it as 2 – 4pks so you can keep one for yourself and give one as a gift, or keep them both, it’s up to you! In today’s digital world, sweating the small stuff like finding your car keys is the least practical thing to do, after all, time is money. So instead of spending time locating for your missing items, let Pixie do it for you. If you’re ready to “pixify” your life, it’s time to get it for yourself today!